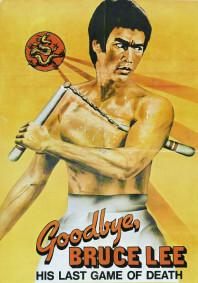 In 1976, the US distributors of this film (originally titled The New Game of Death) were at the centre of a lawsuit involving the Pennsylvania Bureau of Consumer Protection for selling the film as a genuine Bruce Lee vehicle. A disclaimer was later added to all subsequent publicity claiming the film to be a ‘tribute’. Viewers in the west in the early 1970s who were unaware of Bruce Lee’s scant cinematic career can be forgiven for being duped by this deliberately ambiguous piece of Bruceploitation, given its crafty title and meta premise. It starts with scenes involving the professional Bruce Lee imitator, Bruce Li, going through his gymnastics regime (he was a real-life gymnast and sports teacher) before being talent-spotted by a film director (played by the film’s actual director, Lin Bing) due to his resemblance to the late Bruce Lee. The producers take him into a screening room where he is shown Bruce Lee’s final, incomplete film, in an attempt for Li to research the late actor’s martial arts skills and mannerisms. The rest of the film then focuses entirely on the film within the film; a rather perfunctory crime premise in which Bruce Li (not Bruce Lee) stars as a noble kung fu hero who becomes embroiled in a money scam and forced to take on Lung Fei’s gang. The whole set-up is a big exercise to get Bruce Li to don the iconic yellow jumpsuit and take on a succession of exotic fighters in a pagoda setting stolen from Game of Death. He fights a crazy Samurai, a near-naked wrestler dude, and an Indian mystic with nunchakus. Like a lot of Bruce Li’s films, he somehow manages to inject something of his own personality into the whole sorry experiment. The film is also elevated by its own theme song: the damn funky ‘King of Kung Fu’ by Candy, which is played repeatedly throughout the film and never once gets tiresome. AKA: Legend of Bruce Lee; The New Game of Death.